February | 2009 | Keep Your Eyes Peeled. What one names their home is kinda of a big deal here in Athens. No one sheds any tears, but solid amounts of thought go into peoples’ decisions. Two years ago, before we had even moved into our house, my roommates had already settled on the name Bruce Manor. It’s a combination of Bruce Banner (the Hulk) and Wayne Manor (home of Batman). I believe the logic goes: both Batman and the Hulk are great and our house is painted green on the outside. That being said our house has become a venue for touring musicians to come and play. We’ve gotten some pretty small (and in some cases terrible) acts, who are traveling the country to come play a show in our living room or basement, and in most cases spend the night. We’ve also had legends come and stop in as well. The man who comes to mind most in Michael Hurley. He’s 68, and has performed folk music all over the country since the 60’s. He’s been covered by Cat Power and influenced musicians like Calexico, Lucinda Williams and his music was even used in HBO’s Deadwood. It’s odd how much a show in your living room changes your perception of where you live. I love it, I really do. But having to almost leap over people in the room I usually reserve for eating breakfast and reading the newspaper can be jarring. Attached is a photo taken in my living room last month from a small show in my living room. The act was called Annikki Dawn and they’re a traveling act from Providence, RI. This show was beautiful, simple, intimate and probably one of my favorite ones we’ve had so far. Next month we’re hosting Phospohrescent, which should be amazing and if everything works out, we will be having the front man from the now defunct band Pedro the Lion performing in April. With everything that is going on with the news industry, it’s interesting to see how that is playing with one of the media’s largest barons. In a recent piece from the New York Times, it appears as though Rupert Murdoch’s love of print may be his Achilles’ heel. He owns one of the largest cable news channels in America as well as media empire that stretches throughout the English speaking work and beyond. But them man still likes his morning paper. Charming for some, but for shareholders, they aren’t as pleased. 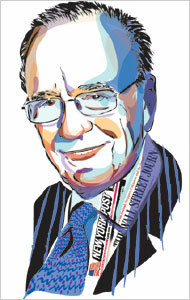 The declining economy and the sinking fortunes of print publications have placed in stark relief Mr. Murdoch’s love of newspapers and his deal to acquire Dow Jones just before the recession set in. Mr. Murdoch, chairman and chief executive of the News Corporation, paid more than $5 billion for an asset that generated about $100 million in operating income last year, a price that now looks like a staggering overpayment. Mr. Murdoch declined to comment for this article. LONDON — Before television shined its warped light on her, Jade Goody was surely destined for a life of hardship and obscurity. Crude-talking, hard-drinking, overweight, barely educated, in debt, the child of drug addicts, she appeared on the reality show “Big Brother” in 2002 as a kind of token lowlife. But something about Ms. Goody, then 21, struck a chord — even if it was a patronizing one — in a restless nation searching for ways to allay its millennial boredom. She became a bona fide media star, a working-class Paris Hilton. Britons eagerly devoured every detail of her life, no matter how banal. They worked out to her exercise videos, bought her perfume, read her autobiography and, when she made racist remarks about an Indian actress on “Celebrity Big Brother” in 2007, angrily turned against her. Now they are watching her die. The cancer has since spread to her liver, bowel and groin; on Friday, her doctors told her there was nothing more they could do. And then she told the British public. This is reality television carried out to its most extreme, grotesque conclusion, one not even envisioned in the film “The Truman Show” all those years ago. The question of why, exactly, the story is so compelling — how to negotiate the line between poignant and voyeuristic, whether newspapers are exploiting Ms. Goody or she is exploiting them — has twisted the media into knots, even as they provide daily updates on Ms. Goody’s deteriorating condition and state of mind. The most interesting part of the article is that the reporter, and many media critics, are struggling to find out who is taking more advantage of the situation. Are the tabloids and TV stations taking as much as they can from this woman who has lived most of her adult life in the spotlight? Or is Jade the one to blame for trying to make as much off of this event as possible. Later in the article, it is reported that Jade has sold the rights to her wedding to OK! magazine. To address this, I turn to my perennial favorite, Ricky Gervais, one of the funniest men alive. If you haven’t seen his show “Extras” well, it is incredible. In the series finale, Ricky’s character Andy has had widespread success starring in a base, mindless sitcom which has received huge ratings. The only problem is that is not what Andy wants. He has risen from the role of an extra working for little money in the backgrounds of scenes, to the starring role of a major network sitcom. Frustrated with the wrong kind of success, he is asked a question, “do you want to have integrity, or do you want to be rich and famous?” He picks famous and find himself on “Celebrity Big Brother” What follows is him slowly breaking down, having resigned himself to the lowest of low that entertainment has to offer. He finds himself surrounded by people clawing their way through show business, sacrificing their humanity for just one more shot at fame. Please watch the end to the series finale, its one of the best moments television has created in the past decade. Florida is one of only nine states without an income tax – the state constitution bans it – and its taxes on corporations and financial transactions have been gutted with exemptions. The state depends for revenue on real-estate deals and sales taxes. In 2005 the LeRoy Collins Institute, at Florida State University, released a report warning that the state budget was over dependent on the housing boom and would soon experience deep shortfalls. Beyond simply having laws in place that set up the system for failure, the amount of shady deals and laissez-faire policies going on in the state are pretty amazing. I’m not going to try and preach economics, because I haven’t studied that at all. But looking at the facts…the story is astounding. Beyond simply telling the story of what went wrong, I was struck by the little glimpses of humanity in a story that can become a tale of dollars and cents. Angie Harris moved into a subdivision called Tanglewood Preserve after many of the homes were foreclosed on. She was able to buy a home on the cheap since home prices had fell. Her new neighbors, who could not sell their homes, have approached her with hostility. Easy credit and mistrust are two sides of the same economy. This explained, at least in part, why Angie Harris avoided her neighbors in Tanglewood Preserve, and why the shunned her: she made them feel that they’d been duped. Any reactions from Florida? I haven’t been in the state since 2003, so I haven’t seen any of this first hand. I’m eager to hear some first hand accounts. An extremely insightful blog that deconstructs and examines news photographs in terms of their relevance, socio-political meaning, symbolism etc. It’s really incredible to see how much someone can glean from a single photograph. It gives me hope that single images matter and can inject layers of meaning into a frame, so long as people are there to think about it. It just so happens that this quarter I happen to like every professor I have. I even like the TAs. I’ve been blessed with four passionate professors who all have their own odd senses of humor and REALLY know their stuff. Seriously. I was such a slackers in high school. Honestly, books are sweet. Currently reading Don Delillo’s White Noise for class and am enjoying it immensely. I had a chance to read a man by the name of Randolph Bourne in my class on the history of American cultural rebellion, and I must say he was decades ahead of his time. My good buddy Noah just through up an edit of photos based around one of Bourne’s essay “The Experimental Life”. I’m just gonna say read this . It’s dense stuff, but the amazing thing about his writing is so much of it resonates perfectly in the rise of youth culture in the 50s and 60s (the Beats and then the Hippies) but his most renowed writings were penned between 1913-1918. SERIOUSLY. I just made a homemade batch last night and had a bowl for lunch. This is something that cannot be overrated. The man swings. I love this music. That’s all. I’ve got some film to scan, more pictures will come soon. It has been a long, not terrible cold, not terribly eventful winter. I find myself covered in books and reading, not taking as many pictures as I’ve like. But there is room for some. From a recent assignment about the university’s medical facilities for Athletes getting an upgrade. This is Tommy Freeman, one of the big guns on the Ohio University basketball team getting checked out before a game last weekend. And since I never really put these pictures up, here are some from winter break, taken with my little compact Canon G9. My girlfriend's grandparent's awesome house in Indianapolis. I made some bagels on a whim, I will make them again as soon as possible.